One of the very best small amps I have had the pleasure to work with is the Blackstar HT1R and it also happens to be a real tube amp. Everyone has an opinion, but here is mine: Tube amps (“valve” amps outside America), if designed well, sound better than most solid state or digital amps. I love technology, amp modeling and digital effects, but real tubes can bring gorgeous tone. Although it won’t win any volume contest, the HT1R‘s sound is immense. More than adequate for practicing and perhaps usable in a small gig, like a coffee shop or cafe gig where big volume has no place. The Blackstar never sounds strained. It never gets shrill or piercing. It remains warm and organic up to its highest volume. Pretty amazing considering how small it is. The HT1R is a two channel amp. Channel 1 goes from clean to crunch and classic rock. Channel 2 keeps on trucking up into hard rock and metal. The versatility of the gain stages is excellent. And don’t forget, there are no parlor tricks, just pure tube saturation. Glorious. The HT1R is also excellent for jazz and blues. Looking for a “dark” jazz tone? This is the real deal. The HT1R is great at dark sophisticated tones. In fact, while it can be set brighter, it never gets into an uncomfortable zone. Like I said, it doesn’t get shrill. The HT1R has an 8″ speaker, but you would never know it. Close your eyes and this has a really full sound. It never sounds strained which is surprising. Testing it on a wood floor in an empty room, it sounded as though I could have been playing through a much larger amp. Testing it on a desk in an office, same thing. Glorious tone. Blackstar amps have an “ISF” knob. It stands for Infinite Shape Feature. Whatever they call the circuit, it works like a tone/presence/brightness dial all rolled into one. To the left, it conjures up classic Fender amp tones (Fender “Blackface” and “Silverface” tones to be technical) , and to the right, it gets more woody and more into extremely authentic Marshall tones. And you readers know I love Vox, and Vox-y tones are in there too, maybe around the mid-point, slightly left. The HT1R simply has a single ISF knob for all your tone tweaking and it works like a charm. Stereo? Through its single speaker, the amp is clearly not stereo. But it has a headphone jack which doubles as line out for recording, and guess what? It’s truly stereo. Few amps with headphone jacks sound good to me. This is an exception. Blackstar provides cabinet emulation through the headphone/line out signal so you really get some great headphone experiences with this amp. Some real “in the room” tones. And engage some reverb and you hear this studio quality stereo reverb kick in. Oh, and it even has line input in case you want to play along to something. Plus, it has a speaker output to connect to another cabinet. Does it get any better? You can certainly use the HT1R without any pedals or effects. If you crave tone and maybe some reverb, the amp on its own has you covered. Just for kicks, I threw some pedals at the amp to see what would happen. Tube screamer and other overdrive pedals work as though they were running through a big Marshall, simply wonderful. Just to experiment, I wanted to see how a treble rich “scooped” distortion pedal might sound. 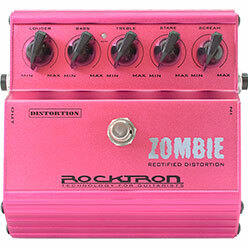 So, I brought out a Rocktron Zombie Rectified Distortion pedal (click here to get one). Comparing the Zombie through the Blackstar and a Vox AC15 side by side, both set clean, the tiny Blackstar was the clear winner and produced the 3D sound the Zombie is marketed as being able to produce through a genuine tube amp. The Zombie is higher gain than my taste but sounded musical through the Blackstar and remained organic like a fire breathing hi-gain stack. In comparison, through the Vox, it was impossible to dial out the shrill factor. So for pedals, I would say the Blackstar can handle most anything you can throw at it. As to fit and finish, the cabinet, grill cloth, leather handle and control panel are top quality. The fit and finish on these Blackstar amps is excellent no matter where they are made. 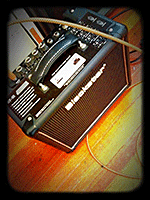 And even though its a small amp, it has a bit of weight to it, not so much to bother you, but enough to take notice. 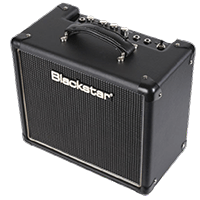 It is my understanding that Blackstar was started by some wizards who left Marshall to start their own amplifier company. Like Marshall, it is headquartered in the UK. So with Blackstar, you get a bit of Marshall and a bit of british pedigree and no doubt that contributes to their quality tone, build and circuit designs. If there is a better 1 watt tube amp, or a better sounding small amp, I simply haven’t heard it. Always warm, never strained, the Blackstar HT1R is the best small amp and the best 1 watt tube amp I have had the pleasure of using. I give it 5 stars and I highly recommend this amp if you have a taste for great tone.